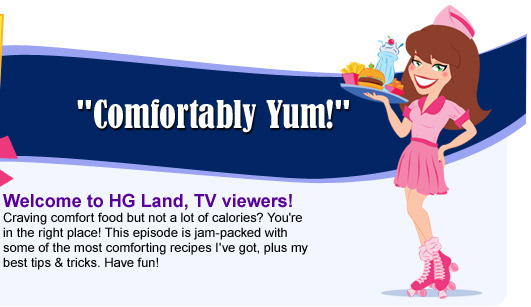 home > episodes > Comfortably Yum! Get the details right here, right now! How do you make no-guilt bread pudding even better? You add peanut butter and chocolate. DOY! Bread 101 - Looking for something light to make a sandwich out of that pulled pork? Pick up 100-calorie flat sandwich buns, like Arnold Select/Oroweat Sandwich Thins! Seeking slices... perhaps for whipping up bread pudding? Look for loaves with 40 - 45 calories and at least 2g fiber per slice. Sara Lee Delightful is a personal favorite! Mashed Potato Must-Haves - Potatoes are a given, but don't leave some other good stuff out. Cauliflower is perfect when steamed and mashed -- mix some in and your mashies will go twice as far. You'll also want some light whipped butter or light buttery spread. 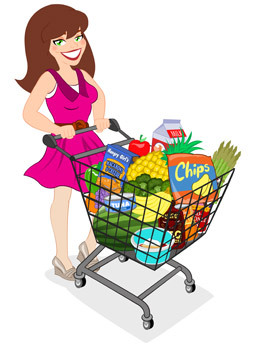 Brummel & Brown is my FAVORITE, but the kinds by Land O Lakes and Smart Balance are good too. Grab some fat-free half & half and you're good to go! Click here for the full recipe. Green Giant Frozen Broccoli & Cheese Sauce - This is more than just the key ingredient in my Too-EZ Mac 'n Cheese. The saucy green veggies are also great with baked potatoes and for making my Cheesy Broc Star Soup. Look for this stuff in single-serving trays -- a.k.a. Just for One! -- and multi-serving bags. Spreadable Low-Fat Cheese Wedges, a.k.a. The Laughing Cow Light - These things make everything better, richer, and more delicious. Only 35 calories each and great in mac 'n cheese. I could go on and on about these, so click here if you want to know more! Whole-Wheat-Blend or High-Fiber Pasta - My go-to pasta pick will always be Tofu Shirataki noodles, but whole-wheat/high-fiber options are great for when it's GOT to be the real thing. I'm a fan of the high-fiber pastas made by Ronzoni and Barilla. Broccoli Cole Slaw - This shredded veggie mix is a secret ingredient in my Meatloaf Minis! It has tons of other uses, as well, so click here for the 411! These recipes are your one-way ticket to Comfort Town! 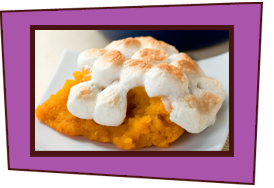 I Can't Believe It's Not Sweet Potato Pie - Did you know that butternut squash makes an amazing swap for sweet potatoes? Well, you do now! Supersized Recipe! Miracle Mashies - These lightened-up mashed potatoes are the food equivalent of a warm blanket on a cold day. Plate-Lickin'-Good Chicken & Waffles - It's true... There's a recipe for guilt-free fried chicken with waffles! Supersized Recipe! 10-Alarm Turkey Chili - Rich, hearty, smoky, spicy, and soooo good. Your life as a chili lover may never be the same. Super-Cheesy Crazy-EZ Shepherd's Pie, "Twice-Baked" Mexi-tato, and Tuna Noodle Casse-bowl - THREE comfort food quickies with only THREE ingredients each! Funkadelic Chili Mac - Noodles smothered in zesty chili and topped with cheese sounds like a high-calorie item. But you know me better than that, right? Kickin' Buttermilk Faux-Fried Chicken - These tenders are flavorful, crispy, and SO much better than the fatty alternative. Bite 'em!